The French astronomer Gassendi planned to observe this transit from Paris using predictions from Kepler's "Rudolphine Tables" of planetary motion published in 1627. Unfortunately, he missed the transit due to the fact that the tables were not accurate enough to show that the transit actually took place during the early hours of December 7th while the Sun was still below the horizon in western Europe and in particular Paris. Venus crossed the disc of the Sun on 1631 December 7th. The map above shows the global visibility of the event. The transit could be seen in its entirety from Australasia, southern and central Asia, the Indian Ocean and eastern parts of Africa. The Sun set while the transit was in progress in the grey areas encompassing the central Pacific Ocean and parts of north-eastern Asia. The Sun rose while the transit was in in progress in the grey areas taking in Africa except the eastern part, south-eastern Europe, eastern Russia and the Middle East. The yellow lines on the diagram show the position of the terminator, where the Sun is either rising or setting, at the key phases of the transit. The geocentric circumstances of the transit are shown in the diagram above. During the transit, the diameter of the Sun was 1949.9 arcseconds and that of Venus was 63.2 arcseconds. In other words, the diameter of Venus was 0.03 that of the Sun, making it look like a rapidly moving sunspot. The whole transit lasted just under three hours. All timings are given in Universal Time (UT). Local time in Jerusalem is 3 hours ahead of Universal Time. Despite the fact that this transit was probably unobserved, Jerusalem has been chosen as a possible observing site to demonstrate how the transit might have been observed inadvertently during sunrise when atmospheric extinction or low cloud would have made the Sun's disc easier to observe. The progress of the transit as seen from Jerusalem is summarized in the diagram below. The left-hand panel shows the movement of the Venus across the solar disc. The top of the diagram points to the zenith, the point directly overhead. The position of Venus is marked every UT hour. The right-hand panel shows the movement of the Sun in the sky during the transit. The transit started with exterior ingress just before the start of morning civil twilight at 03h53m (UT) as seen from Jerusalem. The Sun rose in the south-eastern sky at 04h27m (UT) and interior ingress occurred at 04h47m when the Sun was only 3° above the horizon. Venus had taken nearly an hour to cross the limb of the Sun. Approximately three quarters of an hour later, Venus reached its minimum separation of 929.2 arcseconds from the centre of the solar disc at 05h27m when the Sun was 10° above the horizon. Venus started to cross the limb of the Sun for the second time at 06h06m (UT) and the transit ended at 07h00m (UT) when the Sun had reached nearly 25° above the horizon. 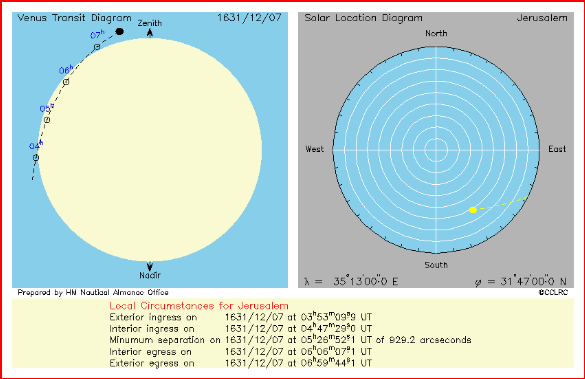 Summary plots like the one shown above and animations showing the motion of Venus relative to the Sun as seen by someone observing the transit through appropriate eye protection are available for several locations worldwide. The summary gif files are ~18Kb and the animations are ~200Kb. To view the animations properly, it may be better to download the animations and view them locally.